Ole Worm and Thomas Bartholin are my two favorite Danish seventeenth century personages. Worm, a generation or so older than his nephew, was an inexhaustible curiosity himself. There is so much to say about Worm, it is hard to imagine that there isn’t a multi-volume biography of him,if there was it would be on my shelf [Next to the Germanus Incredibilis of Kircher] But as far as I know there is not. My first exposure to Worm was when I bought a copy of The Museum Wormianum, seu Historia rerum rariorum,1655 from Ahab Books back in 1991, it was a wonderful copy, I still miss it! But over the years, every time I have had a chance I’ve bought yet another copy (and sold them). In 2005 I had the pleasure of seeing What Worm’s museum really looked like at Rosamond Purcell’s ‘Bringing Nature Inside: 17th Century Natural History, Classification, and Vision,’ Special Exhibition Gallery, Science Center at Harvard. That further whetted my desire to find more books By Worm. Since then I’ve had the pleasure of having about half a dozen books by Worm. At the same time I had a few authored by members of the Bartholin family. From this great family Thomas stands out,perhaps it is due to his upbringing…. 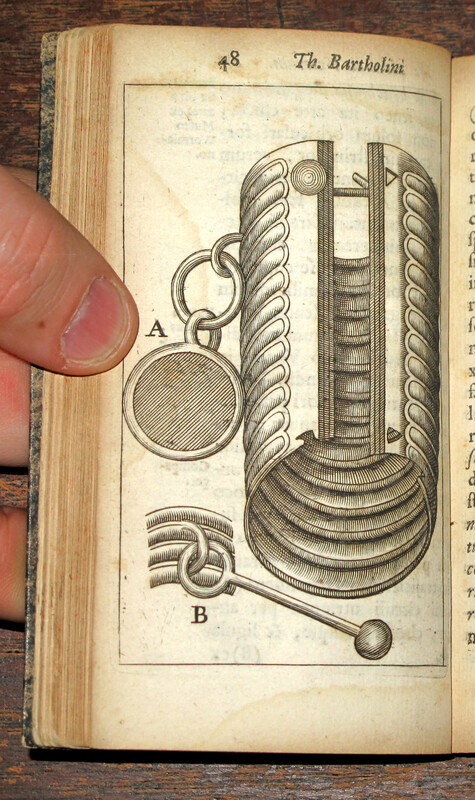 Thomas wrote many interesting medical books and made notable discoveries. I especially like his little book on the medical use of snow. In the book I offer today, both Worm and Thomas Bartholin tackle early artifacts of Tutonic, culture. In the De armillis veterum schedion and De aureo cornu Danico :Worm and Bartholin use their scientific training and imagination tempered with their rare intellects to discuss the obviously valuable and ancient finds,of golden artifacts in a new way, not just physically valuable but historically so. 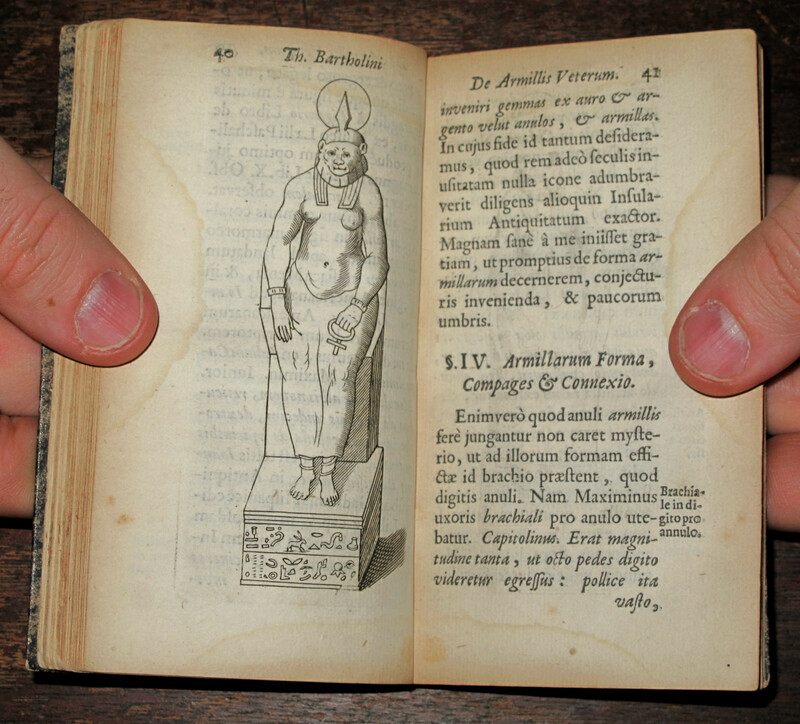 This book has further intellectual excitement added by Fortunius Licetus, Who authored a wonderous book on Monsters “De Monstris. Ex recensione Gerardi Blasii” 1616,1665. He gives us his response to Worms interpretation of the images on the Golden Horn. They try and reconstruct a history lift quite dark by the lack of available written texts. And like Rosamond Purcell’s recreation of The Museum Wormianum, They gave learning nit just a step up but also a step back! 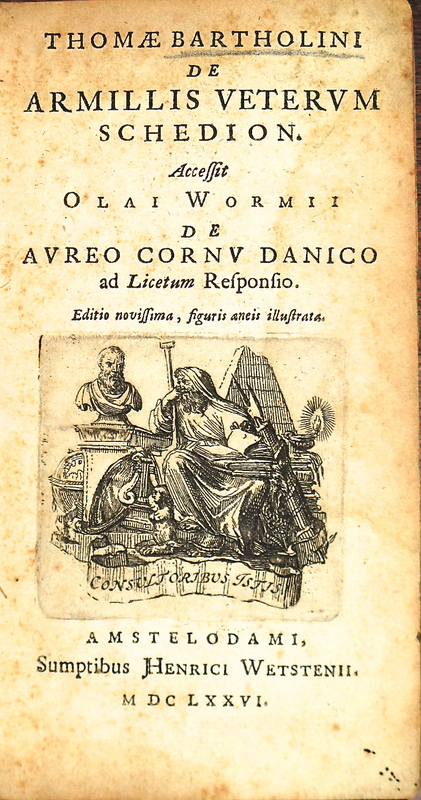 De armillis veterum schedion; De armillis vetervm schedion; Thomae Bartholini De armillis vetervm schedion; Olai Wormii De aureo cornu Danico ad Licetum responsio; Olai Wormii De avreo cornv Danico ad Licetum responsio. Octavo, . * 8 A-E 12 F 4 2# A 12 B 8 This copy is bound in an early pasteboard binding. It has 6 full page plates and one Large fold out plate. Worm’s interests covered natural objects, human artifacts, mythical creatures and ancient inscriptions. He built one of the most well-known curiosity cabinets in Europe, and in 1655 posthumously published Museum Wormianum, or History of the Rarer Things both Natural and Artificial, Domestic and Exotic, which the author collected in his house in Copenhagen. In”Documentng the Factual and the Artifactual: Ole Worm and Public Knowledge” by Jole Shackelford in Endeavour Magazine, June 1999 The Lore of the Unicorn by Odell Shepard He writes “Worm passed along exceptional stories if he believed they came from reliable sources, describing the wondrous attributes of bezoar stones grown inside animal bodies, for instance. Yet he also advocated investigations of unusual objects where possible. Not surprisingly, he considered the authority of ancient “experts” a hindrance to clear thinking. Worm was the first to establish that the “unicorn horn” and narwhal tusks were actually one and the same, as he explained in a dissertation he delivered in 1638. He also disproved the spontaneous generation of lemmings (thought to fall from the sky, perhaps), though he didn’t doubt the spontaneous generation of other organisms. His most illustrious exploit was the one of unicorns. The legend went that they were magical animals, but he determined that they did not exist which was quite logical as nobody had ever seen them. He also established the truth that their famed, magical horns were nothing but narhwhal tusks. Strangely enough he himself could not shake off some other superstitious beliefs about unicorns. One of them was that the horns of these admittedly non-existent animals could heal people when poisoned. To prove that the legend spoke the truth he set out to poison pets for then feeding them ground-up narhwal tusks in order to save them. According to his reports they did indeed survive being poisoned when fed narhwal tusks. Worm passed along remarkable stories if he believed they came from reliable sources, describing the wondrous attributes of bezoar stones grown inside animal bodies, for instance. Yet he also advocated investigations of unusual objects where possible. Not surprisingly, he considered the authority of ancient “experts” a hindrance to clear thinking. Worm was among the first to establish that the “unicorn horn” and narwhal tusks were actually one and the same, as he explained in a dissertation he delivered in 1638. He also disproved the spontaneous generation of lemmings (thought to fall from the sky, perhaps), though he didn’t doubt the spontaneous generation of some other organisms. Beyond his contributions to natural history, Worm laid the foundations of modern archaeological surveys, recommending assiduous collection of information from every archaeological site. 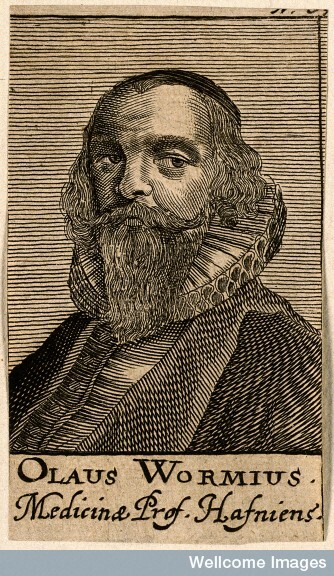 Some historians have argued that Worm’s collection might have spurred the interest of the young Niels Stensen (Steno), who in turn laid the foundations for modern geology. Steno grew up just a few streets away from Worm’s curiosity cabinet. Unfortunately, Worm’s collection did not outlast him very long. His small museum was shuttered after his death, the specimens sent to other collections. Some of the objects likely landed in the Royal Danish Kunstkammer, which Steno did visit, probably more than once. The inscriptions on this horn demonstrated to scholars of the seventeenth and eighteenth century that the early peoples of northern Europe had their own form of writing and could therefore be considered a civilized society. The horns may have been either musical instruments or drinking horns, and were probably buried as votive offerings or loot. Each weighed over 3 kg. The first (complete) horn, was found in 1639 and sent to Ole Worm (1588-1654), professor of humanities and medicine in Copenhagen, Denmark. Worm had a famous collection of natural and artificial curiosities and was also a scholar of runic inscriptions. A second horn was found in 1734. Sadly, both horns were stolen from the Danish royal collections in 1802 and were melted down by the thief. You can see in Worm’s letters, that not only did the horn make an impression, but also the letter and the interpretation. In that same year there were such lively discussions on the horn among the scholars of Königsberg, now Kaliningrad! In 1643 Worm reiterated the description of the golden horn in his great work on Danish runic inscriptions,‘Monumenta Danica’. In 1644, his descriptions of the horn reached for scholars and libraries in Schleswig, Königsberg, London, Rome, Venice and Padua. Several learned men wrote poems for him, and the golden horn was mentioned in an Italian manus. Map Cartoonist Johannes Meyer placed the finds on several of his map of South Jutland. When the Swedish commander Torstensson attacked Jutland in 1643, Peter Winstrup wrote a long poem in Latin addressed to the bishop of Scania (which at that time still belonged to Denmark), the poem was called‘Cornicen Danicus’. It was immediately translated into Danish, entitled ‘The Danish Horn Blower’. He interpreted the horn and its images as an warning of war, and his interpretations were very hostile to the Swedish. Paul Egard and Enevold Nielssen Randulf were among some of the other scholars who interpreted the Golden Horn In the 1640s. They were both deans in Holstein, and had a more Christian interpretation of the horn. 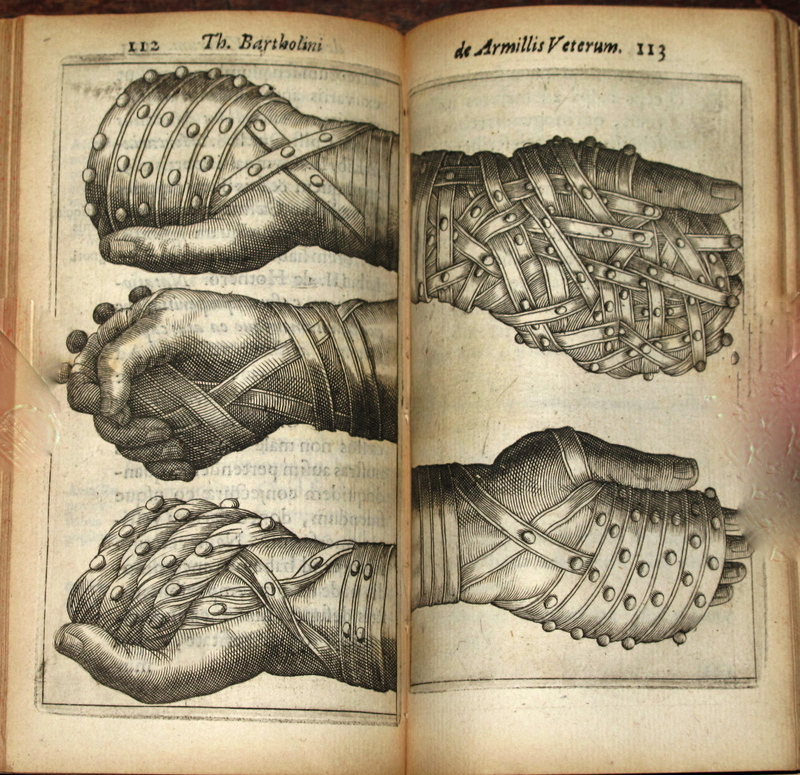 All these works were illustrated with copies of Worms depictions of the horn. The Golden Horn remained known throughout the 1600s, both in terms of interpretations of the horn and designs. In Scandinavia, the 17th-century Danish scholars Thomas Bartholin and Ole Worm, and the Swede Olof Rudbeck were the first to set the standard for using runic inscriptions and Icelandic sagas as historical sources. There is a recent book on the iconic and social development of the Norse renaissance,The Golden Horns: Mythic Imagination and the Nordic Past By John L. Greenway, which places Worm as one of the founders of this mythic imagination.